This is the “primary” story of the issue–a sort of stand-alone “finale” to Jurgens-and-Co.’s run the last couple of years and 45-some issue run. We open on a narration/captions of Jon Kent and Lois talking, against imagery of Superman battling a Khund warship. Jon’s worried his Dad won’t get here in time, as Lois reassures him he’ll be here. As Clark arrives, Lois reminds him that people just want to thank him. We see that they’re at a Thank You, Superman presentation in the park–Metropolis has gathered to try to offer thanks to Superman, though knowing they can’t begin to cover it. Amidst various testimonials of how Superman has impacted and saved folks, Clark keeps thinking he sees further traces of a Khund invasion…perhaps just looking for an excuse to get away from this presentation. Eventually, the crowd gets to see Superman fly into action, as Clark can’t ignore his senses. He finds Wonder Woman, who reveals that there was indeed a major Khund incursion…but it’s been handled. By everyone. Even his fellow heroes are fans, and thank Superman for his role in everything. Without him, none of them would likely be there. On its surface, this is a rather cheesy story of little substance. There’s some presentation to honor Superman, and he’s avoiding it. Then, alllll the other heroes are there as well, because they wish to honor him, too. Neat and simple, right? Evocative of classic Silver Age stories (to me), and not terribly deep. 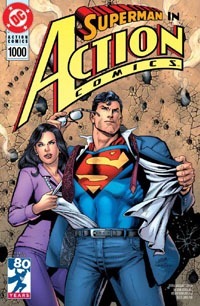 See, this is the 1,000th issue of Action Comics. 80 years of Superman. This is a major event, a one-issue spectacular. An anthology of sorts with numerous shorter stories making up the whole. It’s a standalone issue, something that draws from and can influence other stuff, but it’s not truly coming off any To Be Continued… message. It’s (as an issue) not leading directly into anything. It’s expected that this will be read where the previous few issues, or dozens of issues, or even hundreds of issues, have not been read. There’s loads of “meta” to this–as a story, and as part of the issue. 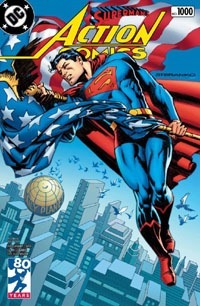 This Superman–Dan Jurgens‘ Superman–comes from a take on the character where Clark Kent is the man, and Superman is a “mask.” This Superman is Clark Kent…who does what’s right because it is right–not to show off, not for accolades and recognition–and is actually rather uncomfortable being the center of attention. And we get to see that…as we get to see a bit of Lois’ personality. She teases him for trying to get out of the ceremony, but we come to see that she’s the one that spearheaded the gathering of the heroes, and helped coordinate with Batman and the others to “cover for” Superman, so that he could have this day, this event. We also see Jon, the son, both AS the Son of Superman and as a kid. Not fully understanding everything going on, loving his dad but not sure if he’ll make it, and an eagerness to stand in for him, recognizing the importance of the situation and wanting to live up to the family tradition. I knew going in that Norm Rapmund was involved with the art…and I was loving the art all through the story. There was something extra familiar about it, though, that had a slight smile trying to escape me as I read it, but I couldn’t quite place it. Until I looked consciously at the credits for the story and realized why the art seemed that much more familiar and was evoking such a reaction in me: Jurgens on the pencils. Of course! Regardless of conscious realization in words, on sight I had recognized the (somehow UNexpected) presence of work by probably my favorite Superman artist! Superman reluctantly accepts the recognition…somewhat awkwardly. The final spread with all the heroes and fans and such…metatextually, real-world…without Superman, there probably would NOT have been any of these other heroes. Certainly nowhere near as many, and probably not even a comics industry. This story is a send-off of sorts from Jurgens–capping off his run, as well as recognizing and thanking Superman. And for one such as me–a 30-year-fan of Superman, introduced to him when I was but 7 years old–this is a powerful piece, meaningful and deep, and moving…and if one has to put a one-off story as a capstone to a run, that stands alone and evokes the past, has elements from the run, but isn’t beholden to it and all that…this does it well, and is a worthy opening to Action Comics #1000! This story opens with a rather hellish, red-tinged image of Vandal Savage having Superman engulfed in some sort of red energy and alien machinery. The narration is Superman, speaking to Lois, apologizing for being sidetracked on the way home–he’s late. Basically, Savage tried to blend Superman with the past, trapping him and leaving the future open for him (Savage) to rule without Superman’s interference. So we get a bunch of pages evoking some key eras in Superman’s history, as we know it in the real-world; but in-continuity the character himself acknowledges that despite the familiarity, he knew it was impossible to have been there in the 1930s, for example. These are all full-page images with the “voiceover” going along with them…not necessarily tied exactly to the image whose page the words are on, but particularly for those familiar with the history of the character and the stories/eras being referenced, the words take on additional (and deeper) meaning than they might otherwise. And the story ends with a shot of Superman standing at a table with a lotta candles (one can assume there are probably around 1,000 of ’em! 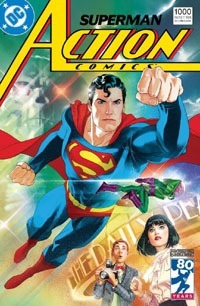 ), Lois and Jon on either side, a “Happy Birthday” sign strung up behind, and even Krypto in the foreground, as we celebrate Superman’s 80th birthday, and the 1,000th issue of Action Comics. Normally I would not care for this sort of story. Had this been a 15-page sequence in an otherwise-20-paged issue of something (especially if at a $3.99 price point) I would be disappointed and annoyed. Even as one of the longest stories within this issue, it’s still a “mere” 15 pages, and as such, even this sequence is a relatively small portion of the entire issue. As a “short story” in this “anthology” issue of numerous creators…it works quite well. 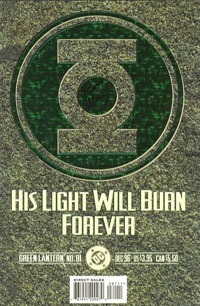 We have a basic story–Superman faces a villain, is flung throughout time, makes it home safe. This reminds me of other stories I’ve read, and feels rather familiar, like it’s a sort of “trope” at this point–where you can have a numerous-issue “event” of a character being thrown through time, or it can be just a casual backdrop “referenced” but not really the point of a story. Here, this does both: it’s a sort of casual-ish “reference” thing…but the pages as we go through show Superman through the decades–Gleason‘s imagery evoking the general “style” and depiction of Superman through the decades. One page reminds me loosely of the Superman vs. Superboy issue from early in the Byrne era; the next is a familiar image from Miller‘s Dark Knight Returns (and signed by the artist after Frank Miller). There’s a page with the black-costumed, long-haired Superman fighting Mongul, with Steel and Superboy in the background, in reference to the Death and Return of Superman…Reign of the Supermen. There’s a page with a version of Zod, the pointy-crystal Fortress of Solitude in the background, and a Superman trapped in the pane of glass version of the Phantom Zone. There’s even a page showing the Kingdom Come Superman facing Magog, a mushroom cloud in the background with several of the other heroes. And there’s a page showing the New 52 Superman breaking through a wall, shifting to the black-costume, bearded Superman of Jurgens‘ Lois and Clark, shifting into the Rebirth costume, into the Reborn costume, punching Savage out. Tomasi and Gleason being the primary creatives the last couple years on the named Superman title that has run alongside Jurgens‘ Action Comics, this is a highly-appropriate story to cap off that run, to share in this issue, and to celebrate and acknowledge the rich history of the character. I often find I’m not overly thrilled with Gleason‘s art–just a personal issue due to comparing it so often to art I prefer–but here, particularly for the time-tossed pages, it shines excellently. I appreciate the history of Wolfman with the Superman character, as well as the very fabric of the history of DC Comics in-continuity and out; ditto the importance of Curt Swan as one of THE Superman artists. That said…I did not really care much for this story. Basically, we have narration from Superman as he’s halfway across the world dealing with a Brainiac threat, while we’re shown a hostage situation involving a principal and one of his students. From the narration, we get that the principal is being mind-controlled by Brainiac, and that Superman is facing the villain…but that action all happens off-panel, concluding with a single image of Superman, that may be recycled from a previous publication. The story is simple, has potential, but for me, personally–especially stacked against the Jurgens and Tomasi stories in this issue, and against numerous episodes of Law and Order: SVU I’ve been watching the last few weeks, it just doesn’t really hold up in a way I particularly care for. It’s not a horrible story, and the art is solid in and of itself…I respect the inclusion here, but other than the “inclusion” aspect, I just don’t really care for this one. This is another short piece that I don’t particularly care for. I like the concept well enough, and it reminds me (as said) of the Xavier/Magneto stuff…and the more I think on it, I realize there’s also a bit of that Batman/Joker meeting from The Killing Joke in here, too. Adams is another whose work I appreciate, whose place in comics history I appreciate…but I just can’t get into his Superman art. I didn’t stick with The Coming of the Supermen, I didn’t care for an Action Comics variant I had from some “Neal Adams Month,” and his Superman in general looks rather “off” to me here. As this is “only” a 5-page story, though, it’s not horrible; but I might have liked a prose version a bit better, as I dig the story much, much more than I do the art. This is an interesting story that seems to be set in the ’30s; the color palette and general art style certainly gives it a rustic, “period piece” look that fits very well with the story being told. A busted-up car is brought into a shop, and when the mechanic tries to get its story from the owner, the tale is a little bit “out there”–all this damage caused by one man? One man lifted it and smashed it against some rocks, apparently. We then move to the owner–Butch–noticing a colorful figure…that of the “man” who smashed his car. 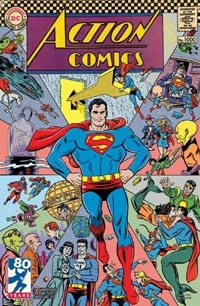 Superman chats with him, showing compassion and having come to “understand” more of Butch’s “side” of things, and leaving him with the notion that even having made mistakes, one can choose to make their life count for something, choose to make something of themselves, better the lives of others rather than doing harm. I’m sure I would have realized pretty quickly that this is a sort of “sequel” to a big part of Action Comics #1; but this benefited SO beautifully from my having just re-read the Superman story from that first issue, and being probably THE freshest-in-mind Superman story for me prior to this 1000th issue. This Superman feels very much like the “modern” Superman, though; less of the rough ‘n tough version from that first appearance. But it works, and makes for an interesting piece overall. Especially when one considers just how heinous Butch’s crime was–kidnapping a woman for rejecting him…and one could likely predict at least a couple likely outcomes of such action. And of the “shorts” in this issue, I think this is one of my favorites. I’m not quite sure what to make of this piece. In a way, I think something to it is “over my head,” perhaps..in a way that I definitely do NOT care for in my comics. Superman arrives at the Smallville planetarium to find Lex Luthor, who has found the “Eye of Xotar” and Chronos’ “Time Scissors”–that together can be used to literally erase any genealogical line from history. Given this is Luthor…obviously, that’d be Superman’s line, the House of El. As the two muse over their shared past, and the present situation, we see a flashback to Luthor’s early days in Smallville, where we also see that a potentially fatal accident that could have killed Luthor was prevented by a young Clark Kent–Superman as a boy. We also get a bit about a “fifth season,” between Winter and Spring, when the weather can be wildly unpredictable…which seems to be a statement of the story itself. Luthor intended to wipe Superman from history, but maybe discovered that it was Superman that had saved him, and so opted not to. This isn’t a horrible story, but as said, something about it just feels like it might be over my head, needing extra consideration, disproportionate to its size in relation to the rest of this issue. The art also isn’t horrible, but not really to my liking. On the last page particularly, I don’t care for the depiction of the “S” shield…its top and bottom seem way too thin compared to the middle, especially compared to the “standard” licensed version I’m used to, that I tend to hold mentally as the “standard” to which the various takes on the “S” are compared. This also plays on Luthor and Superman having known each other as kids–something that was NOT part of the story I grew up on, and so I’m a bit biased against it. Still, knowing that and seeing what’s being gone for here in a way, I’m ok with the story, but won’t single it out as a favorite or such. This is an odd sort of story. While we can consider that the ongoing story of Superman is not one that’s gonna end anytime soon; while we’ve had stories of Superman surviving into the far future–thousands, even millions of years…to consider that he’d live another five BILLION years seems a bit out there for me. It changes the character. It’s best not to dwell on. The point is: to the end of the Earth–literally–Superman has been shaped by his parents. He’s continued to live. He’s lived his life. He’s gone on–but that doesn’t mean that he’s forgotten. The love of his parents–his adoptive parents, the REAL parents he actually knew–they molded him into who he became, and that’s NOT something that changed with time. Their brief moment with him lasted through time, a huge legacy, outlasting the planet itself. But on a smaller level, this speaks in an abstract sort of way to anyone who has ever lost loved ones. Wondering at the futility of visiting a grave, of speaking to those gone before, and I’d say to how even a year can feel like a lifetime, several years like countless lifetimes, when separated from the loved ones. And on a “meta” level, Superman has outlived this planet, outlived all those lives…as he outlived his creators, and has and likely will outlive so many others. On the literal level, this reminds me of an old story of an ancient Supreme or Mr. Majestic (I believe written by Alan Moore) (edit: yeah, I’m pretty sure that was Wildstorm Spotlight: Mr. Majestic #1: a story called The Big Chill.) recalling a world he once spent time on…he thinks its name had begun with ‘E’. On the general level, that abstract level…this just speaks to the heart and I got choked up contemplating loss to come and what that’ll mean to me personally; and teared up considering losses I’ve already experienced. In a way, this had no reason to hit me like it did; yet, this is its own deeply personal, powerful piece…certainly worthy of being a Superman story, and well worth its inclusion in this issue! This is another 5-page “short.” Clark is trying to finish a story, with Perry and Jimmy standing by, noting they’re 5 minutes to deadline, with Printing already giving hell for holding the presses. Even as Clark points out he’s nearly done, he’s hearing cries of distress, and jumps from his seat to go into action, while Perry tells him he has five minutes. Superman stops a runaway train; saves Bibbo; stops space debris from crashing to Earth, and still makes it back to the Planet to finish his story. But turns out in being so focused on that, he didn’t even consider the impact he just had, saving numerous people, maybe much of Earth…that the story he WAS working on is nothing compared to the story of Superman’s recent super-feats. This is a neat piece, and as with others in this issue of Action, not one I’d care much for as an entire issue, but as a “backup,” as a piece included in this issue, I really like it. And with Louise Simonson writing and Ordway on art, it’s one that’s hard to beat, having such positive memories of both creators’ work in the ’90s on my early Superman comics. And the idea of Clark Kent, Reporter, working, having to deal with stuff as Superman and still make his deadline is not new, but it works well here…and the fantastic art just makes it a beauty to behold. I enjoyed this for that, and its relative timelessness. What would a big, giant Superman comic be without Mr. Mxyzptlk? 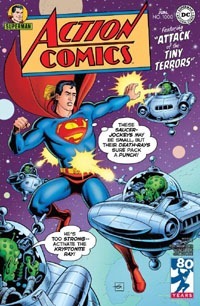 This is a short story showing an amusement park take on Superman and his history, where visitors get to “ride” in a replica of the ship that bore baby Kal-El away from Krypton; lift a tractor like little Clark in Kansas, witness Superman performing super-feats, view other heroes that served with Superman, as well as villains that were fought, and then the way things ended, with Superman… sacrificing himself…giving his life…the ending? The scene we’ve been seeing is a reality of sorts from Mxy, who just can’t quite figure out how he’d like to see the story of Superman end, even though he himself has the power to blink him out of existence with hardly a thought. I think my initial thought–that it’s “fitting” to have Mxy get a story in something like this–comes from the Newstime special after the death of Superman, where there was some throw-away piece referencing the character, sort of explaining his showing up during all that, and yet not having an actual issue til well after the return. Story-wise, I’m not overly enamored. It’s a solid enough piece with an interesting premise. Structurally, not a bad story. I think I’ve just kinda felt put-off to Mxy stuff after Superman: Reborn and being reminded of stuff from Whatever Happened to the Man of Tomorrow? recently. It has its merits–a glimpse at parts of Superman’s origins; shows us Mxy himself and reminds us he’s around and his powers, and that he can be “just” an imp messing with Superman without wanting to truly destroy him. I just didn’t singularly like this story that much. Art-wise, this is solid, and though Dini has plenty of pedigree himself, having a new Jose Luis Garcia-Lopez story is quite appealing on principle. I can’t say I’d recognize the art on sight, but knowing Garcia-Lopez has significant association with Superman, this certainly deserves its place in the issue! This was an interesting story, touching on elements that I don’t often think of with Superman stories. A gunman with a hostage prepares to pull the trigger…while from a significant distance, Superman’s flying as fast as he can to the scene. We get Superman’s inner thoughts as he zips toward the gunman, even as he pulls the trigger and the bullet begins to move, as Superman does the math and everything remaining as-is, knows he will not make it in time. Yet, it turns out while he was focused on the gunman, the hostage was shifting, which bought the extra fraction of a second Superman needed to get there, and he saves her. He compliments her on her bravery, that she could be Police, and flies off. The story here does a good job with building tension as Superman tries to get to the scene. All too often we have the imagery and stories of Superman getting somewhere JUST in the nick of time to bounce bullets off his chest, or pluck them from mid-air, mid-movement before they strike their intended target…but we rarely get something from his point of view, where even he might realize he will be a fraction of a second too late. We get a positive ending here, though, as the woman–Lila–shifts to resist her attacker and Superman is able to save her. I was not expecting a Meltzer piece, but he’s another name that I feel certainly deserves his place and involvement with the issue…if not for prior Superman work, then for his real-world involvement with stuff–helping bring attention to the Siegel house, helping bring about the Superman display at the Cleveland airport, and other involvement with folks preserving the history of Siegel and Shuster and all that. The art isn’t bad…and actually, is quite good–overall. There’s just something to the way Casaday does Superman’s face that seems really “off” to me. It looks like someone else’s face, a stranger’s face, is pasted onto a body with “a” Superman costume. Where some artists’ Superman is recognizable just by the face, I wouldn’t be able to look at the faces in this story and just form those know this was Superman. For another “short,” I can’t really complain beyond that about this one! Outside of the number, I’m sure this story is one reason for a lot of people to pick up this issue: it offers a prologue to a prologue to a mini-series that itself will lead into the ongoing story in the continuation of this title and rebooted-numbering fifth-volume of Superman. This piece kicks off Bendis‘ work on Superman…and does so with a beaten, bloodied Superman crashing through what looks like a cave wall, and on zooming out, we see a couple more hits as he smashes through the ceiling and out the side of the L-shaped Lexcorp tower, and then hits a road so hard he bounces a few times, destroying pavement, vehicles, and storefronts. Bystanders of course whip out cellphones to take photos/video of the fallen hero, while they try to drag Superman behind a counter. They comment on him wearing “the red shorts” again (rather than the cosmetic change being just there). Some giant creature with a huge battle axe is after him, and after taking a huge punch and repeated jabs from the just-arrived Supergirl, hits her once, taking her outta the fight (sending her flying toward the huge globe of the Daily Planet). Maggie Sawyer and the SCU shows up, though their weapons do nothing to the creature. There’s more discussion from further bystanders of him having “the shorts” again, and the creature continues to get the best of Superman, continuing to physically beat the crap out of him (so to speak), and a simple energy-blast wave-of-the-hand takes a just-returning Supergirl back out of the fight. Transforming the handle of the axe into a sword, he seems to plunge it with a splash into Superman’s chest, as he claims to be wiping out remaining Kryptonians, finishing the job he started when he destroyed Krypton. Once upon a time, Jim Lee was just about my favorite Superman artist–perhaps behind or tied with Jurgens and Ed Benes. But here, I just don’t care for the art. I’m sure part of it is the coloring…this seems “dark” and “grim and gritty” especially compared to the rest of the issue, and feels out of place visually with the rest of the issue. Ditto on the story side–this beating, this violence and Superman just being pummeled and beaten and such, and Supergirl coming off as completely ineffective as well–is sickening after so many happier, brighter, celebratory bits. Sure, this is a new villain, but we don’t even get the name here. We just get nothing but fight. Superman himself points out he hasn’t gotten a name, and the villain accuses him of stalling, rather than giving his name. And sure, on one hand, it would be old-style, stereotypical monologuing or such to just give a name at that point…typically, the villain would be depicted in a large panel with a logo-style word balloon declaring his “cool”-sounding name and such, so instead he calls Superman out for stalling, and on a technical level, I guess this is good to get away from the typical. I don’t like that we’re thrown into the middle of a fight like this, that we end on a cliffhanger, when the entire rest of this issue has been self-contained one-off stories and whatnot. Surely we could have started on a brighter note, seen a bit of a different status quo or perspective maybe hinting at this villain’s coming or some such. I don’t know–but based solely on this 12-page piece, I’m not looking forward to the upcoming Man of Steel mini, and I’m suddenly quite concerned about what to expect from Bendis‘ run, where until now I’ve been content to “wait and see” and been fairly optimistic. 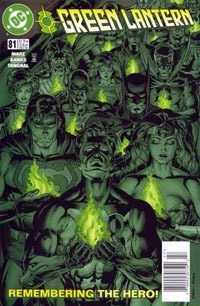 I suppose I’ll now have to “wait and see” what we get in the DC Nation #0 issue and go from there. I guess it’s appropriate enough in its way to launch Bendis‘ run with this issue…and yet despite assurances to the contrary, the part of me that suspects his “coming” heralded the end of Jurgens‘ and Tomasi‘s runs feels like they should have had more pages to play with in this issue, and Bendis could launch with DC Nation or The Man of Steel (after all, the last time, one creator (Alan Moore) ended the previous Superman, and it was the interstitial mini-series Man of Steel where Byrne‘s stuff started. This is 12 pages of what’s likely a multi-year, dozens-of-issues run by one writer, so ultimately may not be indicative of what to expect on the whole and long-term…but for just these pages, and to come after such positive stories for the other 60+ pages…this just seems out of place and inappropriate for something as celebratory as a 1,000th issue…especially seeing nothing but Superman take a beatdown outta nowhere. I’ve looked forward to this issue for a long time. In some ways, I’ve probably looked forward to it for nearly 30 years, ever since the first issue I ever owned of the title (#651). 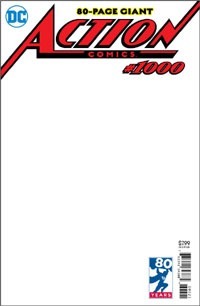 At the least, I’m sure I wondered at a comic making it to #1,000 during the Doomsday! and Funeral for a Friend stuff, and the years following, as Adventures of Superman hit #500, Action hit #700, Superman (vol. 2) hit #100, and so on. I certainly wondered about it seven years ago when DC announced what came to be The New 52, that every single title including Action Comics and Detective Comics would be restarted with a #1. Though I still feel that Action making it to #1,000 technically needs an asterisk denoting the 1-52 sequence (there are no issues numbered 905-956) from the New 52 run. But I give DC a “pass” on that, as it was only one “hiccup” in the numbering. Given cover dress, paper condition, and literally the pricing should anyone actually find a copy of the original issues 1-52, one just needs to add 904 to the issue number to know what the issue is in that sense. There have not been numerous iterations where multiple hundreds of issues here, a hundred issues there, another several dozen issues, a mini-series, and a couple of less-than-20-issues runs suddenly add up to a big number. Number-wise, there’s virtually no reasonable confusion. When Rebirth was announced, when it was announced that Action Comics and Detective Comics would get their original numbering back, and that Action Comics (especially) would indeed get to make it to #1,000, I jumped back in. And all these issues and almost two years later, here we are. I feel like this issue is a sort of reward, an attained destination, a prize that’s been driven toward since Action Comics #957 back in 2016. A few months ago, there was some definite ambiguity as to formatting and such for the issue and what to expect for the issue. Part of me thinks this should have been even bigger, included even more–both in the way of original stories as well as reprints. 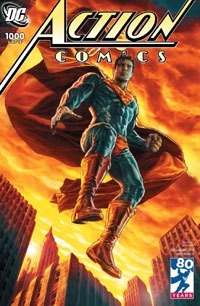 But the companion hardback collection Action Comics: 80 Years of Superman handles a lot of that–with essays and reprints of stories both for characters and creators tied to Superman, and Action Comics itself. I was also a bit curious about what the issue’s story would be, or if it would be an anthology/”jam” issue. 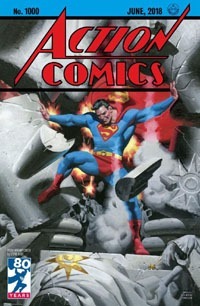 Back in the 1990s there were periodic special issues such as The Wedding Album that were key, integral chapters in the ongoing Superman story unfolding in the actual, ongoing titles; though this would be an actual numbered issue, I’d wondered if this would have any singular through-story that just happened to have a bunch of different artists and maybe some narrative structure allowing for different writers to leave a mark on the story. 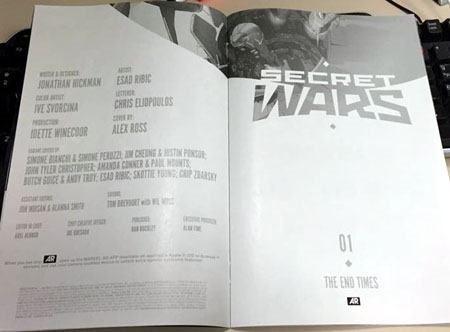 Obviously what we got was 15-page chunks of the two main creative teams of the ongoing titles, and then 8 more stories/contributions, and a 12-page launch sequence from the new writer coming onto stuff. As with my excitement for Rebirth and Action Comics #957, I bought this digitally, and I bought this in-print, and I’ll gladly buy the hardcover edition that I believe will be out this Fall. I also ordered the “Decades Variants” through DCBS, and will be getting the 1,000 covers poster, which will be an excellent, appropriate addition to my comics space. This is an issue that rightly deserves the “celebration” that variants offer. 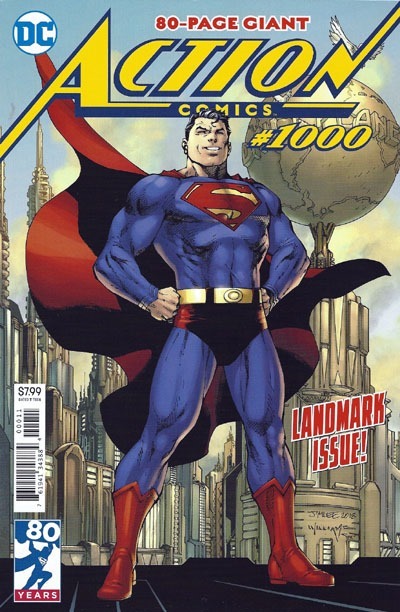 There are artists who may not otherwise have had involvement with the issue, who get to be associated with Action Comics #1000 if only with a variant. 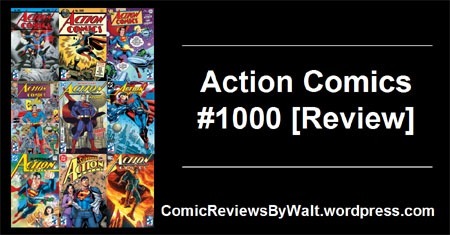 And as the first American comic book to make it to #1000…it’s more than worthy. 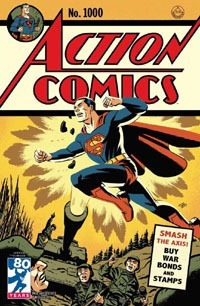 80 years of continuous publication of a comic titled Action Comics is nothing to sneeze at. I’m among the first to complain and gripe and grouse about variants, and will continue to, where they merely cheapen stuff and are “abused” (really, does a #17 or a #81 or a #962 truly deserve a variant? What makes such numbers special if they’re just another issue?) But this 1,000th issue deserves the added recognition, the “fun” of certain variants…especially what I’ve seen of the “Decades” variants, that bring back the logo style and even the DC logo of each decade…the DC Bullet I grew up on is back with several of the issues, and even the “swoosh” logo gets some love with the 2000s variant. $7.99 for a single issue is a bit much in most cases. This is squarebound and has 81 story pages with no ads between stories nor interrupting any stories, and the cover is a stronger cardstock…so this is absolutely worth its price for the physical product as well as the content it contains. None of the stories seem to specifically continue from anything; nothing I’m aware of comes off of a To Be Continued; and other than the Bendis segment leading into stuff out of/after this issue, that’s still 69 or so pages that stand alone quite well, neither requiring previous reading nor requiring subsequent reading. This is well worth getting just for itself; a 1,000th issue; a standalone, celebratory Superman issue. Perhaps it’s an endpoint; maybe it can be a starting point; it’s definitely an excellent one-off, special thing. I highly recommend this to any Superman fan or anyone interested in checking out some Superman content, period, and especially if you don’t want to commit to anything ongoing or long-form. 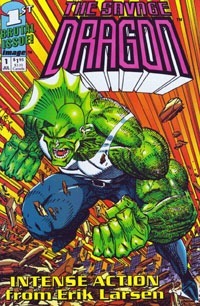 I remember seeing THE earliest issues of The Savage Dragon "on the stands" back at Capp’s Comics, back in the day. I don’t recall if I saw the first issue of Spawn or not, but Savage Dragon stuck out to me, somehow…I’m pretty sure it was the cover, with the bright yellow and red/oranginess and the main character charging forward. It was very much an "image" book in that regard–all flash, at minimum. But I’ve "always" since then been at least loosely aware of the title’s continued existence and ongoing nature, continually marching forth into higher and higher numbers (much like Spawn). As of this writing, the ongoing Savage Dragon title’s just had its 225th issue…which combined with my reading in full the Dragon story from the Image 10th Anniversary hardcover, and the ready availability of several collected volumes at significant discount and having a bit more on my shelf already than I realized has really rekindled an active interest in the character for me. So what better way of things than to go back to the very beginning, to this very first issue of a three-issue limited series (when there was no guarantee the character’d support anything beyond that)? I know the basics of the character’s origin, and little bits here and there, so this issue isn’t as shocking or such as it may otherwise have been. In a lot of ways, there’s something about this that reminds me a bit of the Ultraverse books–plenty of superhero trappings, but some definite, overt violence that makes the book more "mature" without veering grossly into "adults-ONLY" territory. We open on a green-skinned fin-headed cop leaping into battle with some guy named Cutthroat, and the two beating on each other. The green guy eventually wins out and Cutthroat and his girlfriend are arrested. We then flash back to the guy in a burning field, and then waking in a hospital to officer Frank Darling, who questions him on who he is and how he came to be there–none of which the guy remembers. Darling tries to recruit him for the police, but "Dragon" refuses. But when his boss is threatened and then the warehouse blown up, killing him…Dragon agrees to try the police thing. He’s a one-man SWAT team, able to take on super-powered criminals the "regular" police don’t stand a chance against. We see Officer Dragon in more action, showing off his stuff and meeting others (criminal and costumed vigilante alike), before seeing a group of super-powered criminals about to be unleashed…and perhaps making for a rather short career for Dragon! Story-wise, this is pretty basic. It feels like there’s a lot more to it conceptually than actual story-wise…and it’s nearly impossible for me to evaluate this "cold," as I know what I do and so can’t help but come to this already knowing a lot of stuff that wasn’t even available when this was published. That said, it’s cool to read this, consciously aware of things and how they go, while seeing the beginning foundation of it all start to unfold here. This also does as a good first issue should…namely, it introduces us to the titular character, shows him in actions, gives us a bit of an "origin" (at least how he came to be a cop), introduces us to some "minor"/supporting characters, gives us a villain (in this case, several! ), and sows some seeds of what’s to come and makes you want to know where things go from here. The art is solid…the character is very recognizable, of course…and though I’d expect a certain "roughness" to it, there are panels that I’d swear you could show me out of context and I wouldn’t be able to concretely place them as 1993, 2002, or 2017. Larsen‘s work is definitely more refined 225+ issues later, but it’s quite cool to see that he’s held a consistency across 25 years with the character and book. I definitely look forward to diving into the series and seeing how far I get…whether I do a lengthy read now or "soon," but at least the rest of this mini-series! I know I got this issue at least a couple times from quarter bins/50-cent bins…I don’t know if (for whatever 3 or so copies I have throughout my collection) I’ve even paid cover price for the issue TOTAL yet. It’s definitely worth a quarter, and if you can get the whole mini-series, I daresay it’s at least worth cover price per issue to get the whole story. It’s also interesting to note that even though this bears the Image comics "i" logo on the front…this was actually published by Malibu! For a general reading experience, I’d recommend the collected edition…I know Larsen did some slight revisions and reordered the pages into a story-chronological order for the collected volume and fleshed thinks out a bit…so you’ll have a more thorough and refined story reading that way. Still, I enjoyed reading this as a single issue…and even found that there’s a bound-in mini-poster ripe for framing and hanging on my art-wall! This issue brought back a number of fond memories, as well as a new feeling as I “noticed” the art rather consciously this time. Having this issue relatively on-hand for this reading is something I must credit to fellow blogger Chris Sheehan, whose comments/discussion of the issue prompted the purchase and encouraged making the time for the re-read. It was his post that prompted me to re-purchase the issue (for the convenience of immediate availability in print without digging through umpteen unorganized longboxes to locate my original copy). For a single issue, there’s a lot packed into so few pages. 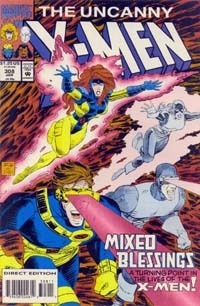 Essentially, though, we have Scott and Jean–Cyclops and Phoenix–walking the grounds outside the X-mansion. For once, there’s no overt threat, no villain interrupting, the world-at-large doesn’t need immediate saving, etc. Just a young man and woman spending time together, enjoying cool fall weather (well, Thanksgiving Day) and doing so amidst a larger group also living on the premises. So we get a bunch of “moments” between characters…and while the couple reminisces, they also come to a decision about their future. This issue is one of a handful of X-Men comics I recall from the early/mid 1990s where we basically just have the characters hanging out at the mansion, interacting with each other in down-time withOUT having to deal with some villain or crossover or whatever. And reading this in 2016 where every story is written for the trade, and every trade is part of some big event and every event leads into the next with no time between…this issue is highly refresshing. There just aren’t issues like this anymore (at least not from Marvel/DC!). The story itself is very much what I prefer in comics, giving us the characters, “quiet” “moments” and generally giving us a glimpse of what these characters do, how they might interact when not in the midst of fighting for their survival. We get to see them presented as actual people…which makes them that much more truly relatable (at least, to me!). 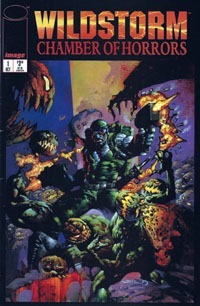 I remember thoroughly enjoying this issue over 20 years ago…and I enjoyed the story now. Unfortunately, while I don’t recall noticing the art–back then, if I did it didn’t throw me–but this read-through I REALLY consciously noted the art…and between this and bailing on a Superman story some time back for so disliking the art, I must conclude that as a general thing I dislike Romita Jr.’s visual style. There’s something to the style–sometimes a sense of sketchiness, other times something to faces and lips particularly that just doesn’t work for me and proved flat-out distracting to me, taking me out of the story itself. Which, while a complaint that I have, myself, is not to suggest the art is bad…it’s just definitely not to my taste, and it now being a conscious thing, it’s something I can watch out for. And then, regardless of the linework and such itself, I had consciously forgotten (but hey, deja vu or such!) how much I dislike the flipping and flopping one must do to read certain ’90s comics, when the artists played fast ‘n loose with the “traditional” comic page and layouts. Some pages read fine, but rather than just varying panels across one or two pages, where one can just page through the issue with a single physical orientation and be fine…here, we’re given some instances with a double-page piece where you have to turn the comic sideways for a top-to-bottom experience with the issue physically turned sideways; others where the issue must be turned on its side for a then-typical left-to-right experience, and so on. Rather than being able to just lay the issue flat and page through, reading, while say, eating a bowl of cereal as breakfast it requires an active, physical experience of manipulating the book, which gets distracting and kicks one out of the story. All in all, though…this is an excellent X-Men comic that I paid less than $4 for, and got so much more from it than any $3.99 new comic I can think of. If you know your X-Men and enjoy such stories, or have never read this, I’d urge you to give it a shot, if you can get the issue for (or less) that $4. If you find it in a 25-cent or 50-cent bin, all the better! Despite a certain grumpiness toward Marvel stuff lately, and being almost entirely out of the loop having consciously AVOIDED most of their contemporary stuff…I couldn’t simply pass this up. I gave DC‘s Convergence a chance, for two $5 issues and a $4…so having been turned off to that, I decided I can at least give Marvel‘s Event a chance for a $5 issue or two. It’s been a long time since I’ve bought an Alex Ross covered issue of anything, and seeing his work on a Marvel anything again is quite cool. 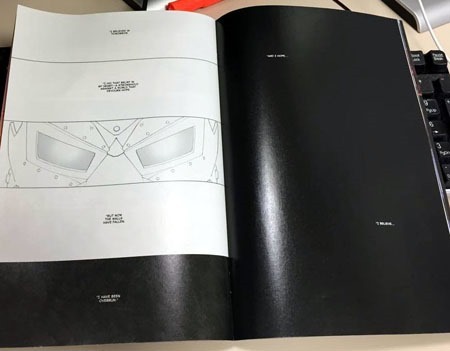 The interior of the issue is about 33 pages of actual story, and additional pages serving as title, credits, character, divider, and memorial pages…with the final pages of story going to black with a few words of text. While that seems at first to be quite a waste of space and pages, I find myself allowing it some leeway as I enjoyed the fade to white effect in DC‘s Zero Hour, and hold to that twenty-some years later. 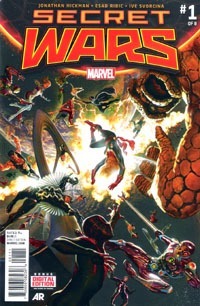 Story-wise, things are a bit choppy to me, jumping between the 616 Marvel Universe and the Ultimate Universe. I’m not at all caught up on current going-ons in the Marvel Universe, but for the most part was able to follow along and get the “core” stuff out of the issue. Much like recognizing a bunch of characters while yet lacking their recent backstory for stuff like Zero Hour back in the ’90s, or any other event, this is what it is for me–a throwing-together of a universe of characters and I didn’t expect to experience this the way I would something I had more familiarity and interest in. I’ve rarely enjoyed Hickman‘s work, and consciously recognizing his name on this project left me a bit dismayed the other day. I could compare elements of his work to Priest–the non-sequential storytelling, the caption/header dividing of scenes, the overall sense of the story not just being some straight-forward thing–but where I enjoy it in Priest‘s work (particularly his classic Black Panther and Quantum and Woody runs) I don’t care for it with Hickman‘s…but that truly gets into a whole different thing than this issue. As such, I expected to have a real problem with the issue’s story. Fortunately, I believe my negative expectation ran deep enough that this failed to be that extreme and so I actually enjoyed the issue as much as I have much of anything from Marvel of late. The art was solid, and while it does not have the “classic” look my mind wanted, it’s mostly clear and certainly modern and on the whole, works for this take on the various characters. There were a few panels where I honestly went cross-eyed trying to visually parse out what was actually going on (especially one with Rocket Raccoon) but the bulk of the thing was good. 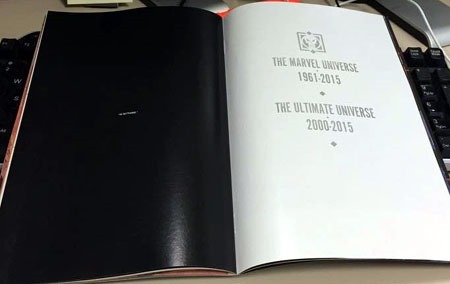 This is definitely being billed as the END of the Marvel Universe AND the Ultimate Universe, with a page at the end citing their “lives.” In that regard, this really should have been a 0 issue or something else, as whatever the Secret Wars part is, that begins NEXT issue with a mashup of the various worlds/timelines/whatever. Still…you could do worse. I mostly enjoyed the reading experience, and realizing the next issue is already due out next week, I’m very much looking forward to it. I’m also looking forward to several of the tie-in minis. As starts go, I think I like this better than any other recent Marvel event I can think of…and if only for the immediate present, it’s certainly got the weight behind it for once as something that does and will matter. I find myself a bit surprised to say so, but…recommended!